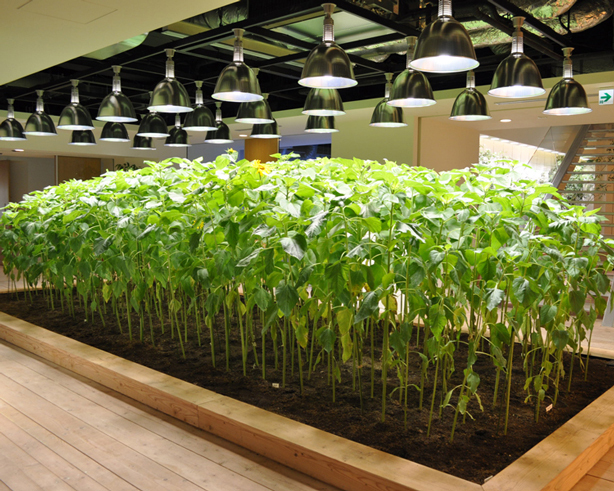 As urban populations continue to expand, indoor and outdoor urban farms have become more prevalent. People want to know where their food comes from. Local fresh food sources reduce transportation costs and lower carbon emissions. 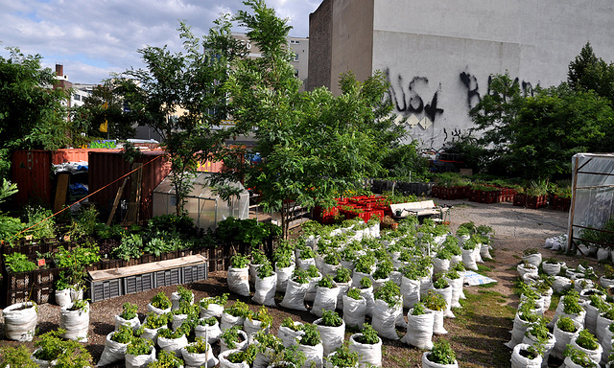 Check out these six urban farms that excel at growing unlimited food in limited spaces. In downtown Tokyo, a double skinned green facade that covers much of the nine story, 215,000 square foot headquarters of Japanese company, Pasona. Along with offices, an auditorium and cafeterias, the company has integrated an urban farming facility totaling 43,000 square feet. Employees tend to the farm, which cultivates over 200 species including fruits, vegetables and rice that they harvest, prepare and serve in the cafeterias. 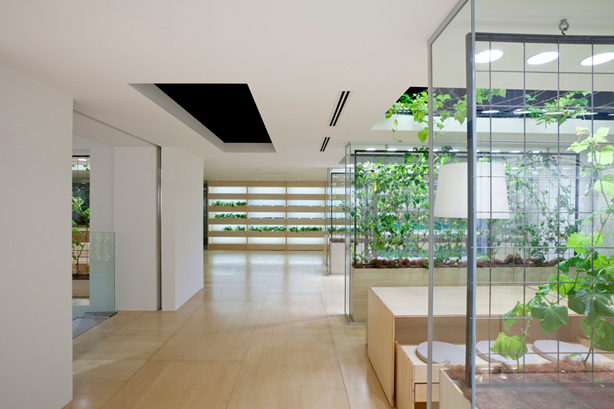 A rooftop garden tops off this direct farm-to-table green space, the largest of its kind sited inside an office building in Japan. Pasona’s farm cultivates more than food. 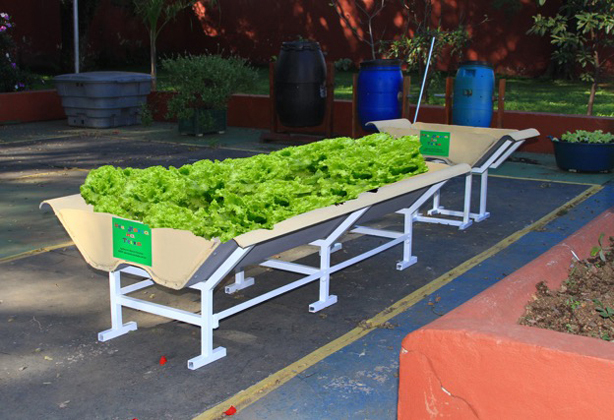 It promotes productivity, well-being, and social interaction while educating the community about urban agriculture’s benefits and technology. 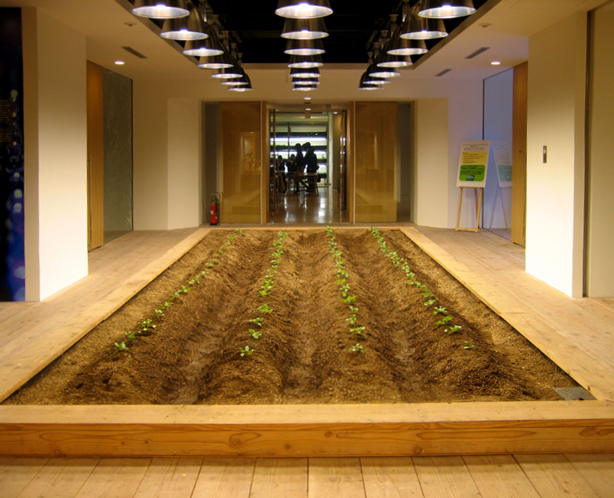 The farm employs both hydroponic and soil based farming methods woven around the office spaces. Tomato vines hang from conference room ceilings, lemon and passion fruit trees function as partitions, salad leaves grow inside seminar rooms, and bean sprouts under benches. Visitors entering the main lobby pass by a rice paddy and a broccoli field. 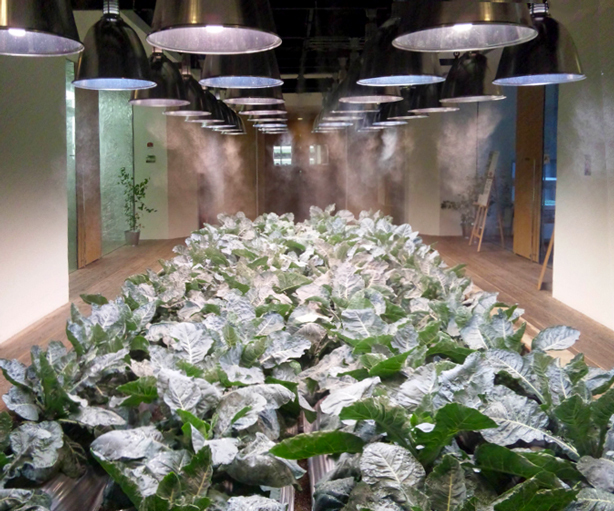 An automatic irrigation system along with intelligent climate control monitor humidity, temperature and air flow required to provide a comfortable environment for employees during office hours, while optimizing crop yield during after hours. Balconies extending from the building feature seasonal flowers and orange trees. The plants utilize the natural exterior climate where their changing leaves and colors beautify the structure’s double-skinned green facade. 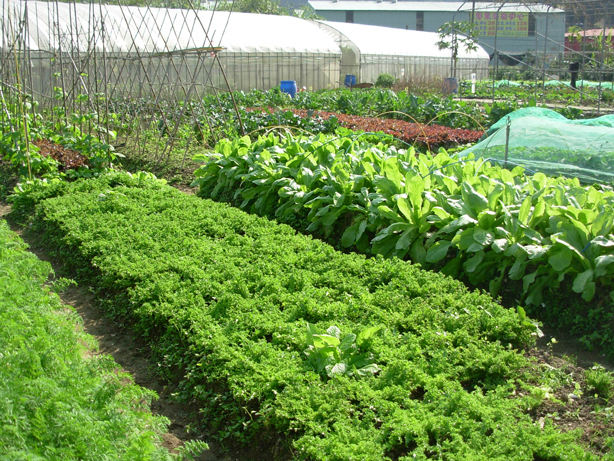 An urban farm in Taiwan, A-hui Organic Farm, has taken a fresh look at community supported agriculture (CSA). 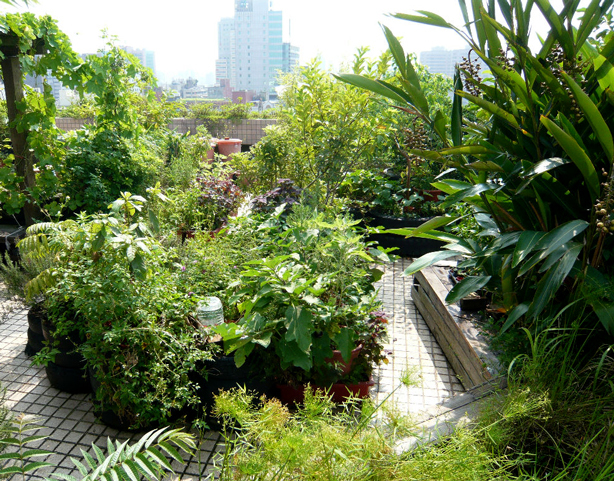 Having already created one of the first rooftop gardens in the capital city, the Winkler Partners Law Firm and the Wild at Heart Legal Defense Association launched this new organic CSA, the first of its kind in Taipei. A-hui Organic Farm, via Winkler Partners. As Taiwan is prone to droughts during the dry season, the farm installed rainwater tanks to help crops thrive even during the driest parts of the year. This recovered water supply helps offset and manage the garden’s relative temperatures and humidity levels difficult to control when relying only on Mother Nature. The farm recycles everything possible and has a rooftop composting toilet which is later repurposed as an all-natural fertilizer. While growing much-needed food, the project also seeks to educate youth by teaching them how to compost. In Seattle, Washington, local residents gathered community support to transform a five acre parcel formerly owned by Seattle Public Utilities into the Beacon Food Forest, a permaculture farm dedicated to growing food, creating community engagement, and encouraging the environmental protection of urban spaces. The food forest employs permaculture methods that mimic growing patterns and features occurring in a natural ecosystem, including attracting and providing shelter for wildlife. In keeping with one of permaculture’s tenets–to offer people access to necessary resources for them to thrive–the Beacon Food Forest welcomes visitors to forage from fruit and nut trees, berry bushes and a pumpkin patch, while they also educate folks about the food they harvest. Marcos Victorino, an agricultural technician in Brazil had been cultivating gardens for 30 years when he started to run out of space. Necessity being the mother of invention, Victorino developed a technique using upside down roof tiles as soil filled V-shaped troughs. Deu Horta Na Telha uses these raised beds to transform available rooftops, balconies and various paved locations into small urban farms. As the tiles are porous and maintain moisture, they help the farm conserve water in an area that is subject to extended droughts. Photo via Deu Horta Na Telha. Victorino’s work isn’t only about growing food. Having recognized the mental and physical benefits of gardening, his elevated raised beds make the farms accessible to children with special needs. 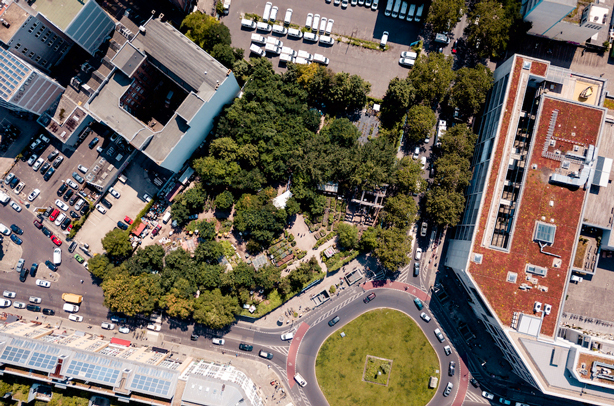 In 2009, a decaying vacant lot that lay vacant for 50 years, became Prinzessinnengarten (Princess Garden), a sprawling mobile urban farm in the city’s Kreuzberg district, not far from the former Berlin Wall. Its moveable raised beds made from recycled containers like rice sacks, crates, and Tetra Paks enable farmers to relocate the entire farm if necessary––yet as investors continue to vie for this coveted real estate plot, urban farm advocates continue their organized protests to protect this community space from development. In the meantime, Prinzessinnengarten’s volunteers educate other locals about growing organic food, sustainable living, and the role of biodiversity in combating climate change. 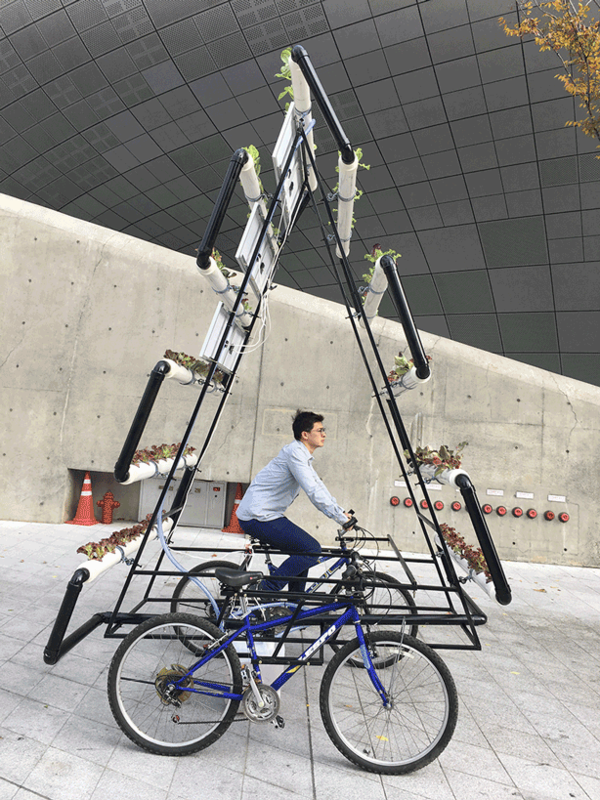 The People’s Industrial Design Office in Seoul, or PIDO, a mobile solar-powered hydroponic urban farm that sits atop two connected bicycles. Based on the bike sharing model, the vision was to make community gardens more accessible and inspire interest in growing a larger fleet of bike farms. Photos via The People’s Industrial Design Office. As urban populations continue to rise, so will the need for a sustainable local food supply in cities with little land for traditional agriculture. Urban farming is a viable solution that cultivates nutritious food, helps to grow the local economy, and turns abandoned and disused spaces into productive ones. This post was written in collaboration with Emily Folk who shares her passion for ecology, conservation and sustainability in her blog, Conservation Folks.